Texas and the Texas Patriots’ PAC offered voters a genuine Saturday night special on November 5th, when Presidential hopefuls Herman Cain and Newt Gingrich debated in a serious, sit-down, punchy-sound-bite-free, substantive discussion on the issues surrounding reform of the three big federal entitlement programs, Medicare, Social Security and Medicaid. Entitlement reform is not just a battle among legislative proposals, financial forecasts and competing budgetary priorities. At its core, this is a battle to achieve reform of the entitlement mentality that is holding much of the world including the OWS protestors hostage in a fantasy worldview that tells them that all that they could ever need or want could and should be theirs, if only somebody would step in and forcibly re-organize society, the world and its wealth. Conservatives know that the real enemy to be defeated in the 2012 elections is the Democrat President running this country into the ground, and the political ideology that fuels him and his Party. So a debate where the clear opponent was Democrat big-government and big-spending ideas and President Obama (and not some other Republican rival) was refreshing. Representative Steve King’s introductory remarks--statistics about the condition of Medicare, Social Security and Medicaid, current projections, impending insolvency, and a host of other information, laid the groundwork for discussion of proposals designed to help, and ultimately to restore sound financial footing to America. More important than the assessment of some very important policy proposals was the emergence of a theme that voters want desperately to hear: Republican answers must include recognition that Americans deserve the freedom to make choices and have more control of their own money, ranging from directing more of the investment decisions for their retirement dollars outside of the government-controlled Social Security system, to more control over health care dollars and decisions. Taking on the personal responsibility inherent in these type programs is a great starting point for eroding the entitlement (“just take care of me”) mentality. America is seeing the Republican Party as the Party of ideas, of freedom, and of the un-mandate. Newt’s point that Americans deplore the mandates that are the basis of the Obama-led healthcare takeover was the springboard for Newt’s premise that Republican proposals should create choices for voters, instead of create new or different mandates. America is also seeing in 2011 that Republicans are the Party of the grown-ups. Republican candidates have proposed a multitude of reform ideas to deal with the impending implosion of our entitlement programs. You can start with reading Paul Ryan’s suggestions and follow up with reading the Presidential hopefuls’ varying proposals. In contrast, President Obama last month gleefully hyped up an audience with a “darn tootin” shout out at a St. Louis fundraiser in support of the creation of another entitlement, free mammograms and contraception to be provided by all health insurers, who would be prevented under a proposed DHHS regulation from charging any co-pay or other out of pocket expenses for the recipients. This "free birth control for all” proposal raises other important issues, but at a minimum it confirms that the Democrat strategy and ideology is to increase and encourage the entitlement mentality (I get free services and someone else – or maybe no one, pays)…the exact opposite of what is needed. Another recent Democrat new entitlement proposal is using federal tax dollars to buy diapers for babies as part of federal block grants that subsidize childcare services. Why should parents who bring these kids into the world be burdened with buying diapers? The OWS protestors are today’s manifestation or outcome of this decades old tactic. While they rightly decry the Wall Street bailouts, the core message emerging from their movement is well summarized on one OWS sign, “Everything Free for Everyone.” Government is where they turn for food, healthcare, college tuition, and now, jobs. Back to the debate…. 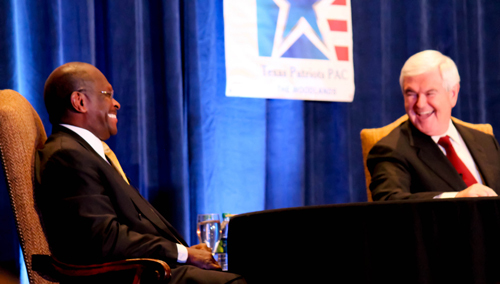 Herman Cain made a common sense proposal to try Optional Personal Retirement Accounts similar to the system in Chile. The Chilean model has been much discussed on conservative blogs and appears to work well, and is similar to the systems functioning well in 30 other countries. His references to ideas he found successful in the private sector were a reminder of the value of private sector experience. Newt made a great point related to bringing spending in DC under control. After noting that America pays between $70 billion and $120 billion (that’s $1.2 trillion) every year out of the Medicare system to crooks, he suggested privatizing the payment system for Medicare so that existing technology can more easily detect and prevent the fraud. Almost impossible to understand the objection, but Obama appears to have rejected this idea. Newt also advocated for gathering “best practices” from the private sector to be replicated by government, as a means to increase efficiency and reduce spending. All in all, it was a night of common sense ideas and rational discussion. 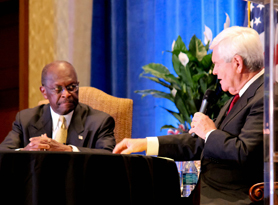 Critics complained that Newt and Herman agreed too much—so we cannot call this a debate. But that was what was so great. They were not looking for reasons to nitpick each other, or strutting for the punchy jab, or sinking into new lows of pettifoggery. They were refreshingly serious—no theatrics, no pettiness. The (humorous?) opening line by Newt that we may be looking at the Republican Presidential team for 2012 echoed the rampant speculation that these two may have concluded that the merging of an extremely well-informed policy wonk with Washington experience, with the business success and personal likeability of a true Washington outsider, may just be a winning ticket. Many debates and little time left to go. Romney still appears to hold the lead, and Perry is financially strong and a historically relentless campaigner. But in the minds of conservatives motivated to show up on primary voting day, this debate proved these frontrunners willing to step up to serious dialogue. While the entitlement mentality is truly destroying our country’s financial security, America is entitled to this level of serious discourse on ideas. THEY WOULD MAKE A GREAT TEAM.